Conversational UI is simply a chatbot experience that easily processes language as if you were texting or speaking with another human being. A Conversational UI gives the privilege of interacting with the computer on human terms. It’s neither natural nor human-like communication, even if by now we are pretty used to it and expect it. Currently, the two popular ways of engaging with conversational UI is through actual speech, think Amazon’s Alexa or through chatting and typing with a chatbot, think Facebook’s Messenger. Conversational UI is more social in the way the user “contacts,” “invites” and “messages” than the traditional apps that are technological where the user downloads and installs. In this podcast, Atish Narlawar discusses with John Mann over the future of conversational UI. John Mann is Technical Architect at @Huge. Terraform a tool that allows you to manage your infrastructure as code. It helps build out and tear down environments on several cloud platforms. In this podcast, Atish Narlawar goes into a brief overview with John Mann about what Terraform is, the concepts of PaaS vs. IaaS and how Terraform helps automate the deployment of not just code but of entire environments. This blog explains the steps required to setup EhCache in AEM. 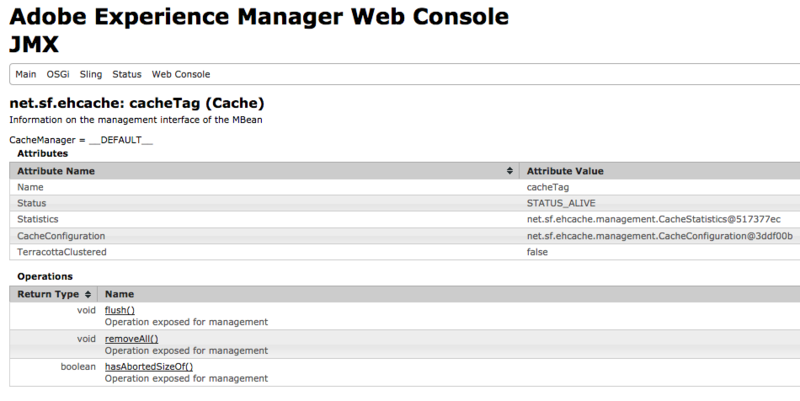 AEM based CMS applications leverage caching at one of the following layers. Varnish Cache is a web application accelerator also known as a caching HTTP reverse proxy. Varnish Cache is fast. It sits between CDN and Application Server and boost performance with its in-memory accelerator anywhere between 5x-10x over using Apache. It gives an additional check on Dos Attacks and can help to avoid Dog-pile effect when CDN cache gets invalidated. AEM dispatcher module can be installed on the Apache HTTP server. It acts as a reverse proxy with a local disk cache. It supports event based cache eviction and authoring, or the publishing instances can send events of deleting and invalidating cache files on these servers. AEM Application Cache is the last layer in the AEM Caching strategy. It's quite useful in the personalization services, where many components need a real-time business computation before getting rendered and cannot be cached in above three caching layers. There are various options to facilitate in-memory Application caching using Redis, EhCache or MemCache. Although it's standard practice in AEM space, I haven’t seen any quick step documentation. Hence, I thought to put them in a blog using ehCache. It can be easily modified to work with other caching implementations. Make sure to use the updated version of the jars. Also, append the Ehcache in the Embed-Dependency in case you are using maven-bundle-plugin configuration. A table with 4 columns will show up (Domain, Name, Type, Properties). Click on "removeAll" and then on "Invoke". Decoupled CMS aka “headless” has rising popularity in the CMS development world. It interacts with display/glass only through API, allows breakthrough user experiences. It gives developers the immense flexibility to innovate, and for the site owners to future-proof their builds by enabling them to refresh the design without touching the CMS. HeadLess CMS made its considerable mark in 2016 and looked like it's going to influence the norm in 2017 CMS development. With this regard, Atish Narlawar talks about HeadLess CMS, its features and best practices to Tan Quach. Tan is Director of Engineering at @Huge and recently lead a development project built using Headless CMS. In this podcast, Tan shared valuable insights about HeadLess architecture, learnings, best practices, hosting options, development, fundamental challenges and overall experience. They start the conversation by going through the evolution of CMS since late 1990’s, and how CMS has shaped from static site generator to more intuitive, omnichannel, the author focused serving the purpose of storing data, CRUD UI and data display. Most CMS got developed with complex monolithic systems and these monolithic applications results to a cumbersome development pain where display logic and backend sits next to each other, tightly integrated, and that's where the inception of HeadLess came into the picture. Tan shares the common architecture patterns of HeadLess CMS based end to end project, and how it speeds up the development process, giving free hands to UI and UX teams for more alienated environments and freedom to use latest isomorphic libraries like Angular/React. He also explains about CMS administration, hosting and scalability. About the development practice, Tan explains how components built for publishing the site, can be re-used for the authoring view and the team can end up having a light weight middle layer between Frontend and CMS for managing third party integrations. Finally, Tan shares his opinion for the teams aiming to introduce Headless CMS into their existing CMS ecosystem with some use cases. AWS has more than 70 services, estimated 2 Million servers and 31 percent cloud market share. The recent Yearly AWS Summit is one of a good place to feel the excitement with 32000 engineers gathering, collaborate with boot camps, and see how things are getting put in reality and what others think about Cloud in general. Atish Narlawar talks about recent AWS Con 2016 to Stanley Tso, DevOps Engineer at @Huge. They start the conversation with the most major topic of the year AWS Lambdas. Stanley talk about Serverless Architecture and architecture patterns emerged from it AWS Serverless API w/ API Gateway, Mobile, and Live Video Stream Processing. Cost is one of the biggest factors for switching from current cloud-based servers to AWS Lambda serverless architecture, and Stanley thinks these savings are going to be the game changer. In one survey it was noted on actual production servers savings goes up to 50-90% of total current cloud expenses. Second, they talk about Alexa, and the concept of Voice user interfaces (VUIs). AWS hosted a workshop to develop Alexa skills using Raspberry PI. User Conversation is the design paradigm and interactions with the application services with little straightforward and natural way going to be a big thing in the upcoming year. Stanley thinks Amazon is pushing hard to make this transition sooner than later. He also speaks cover about AI, Machine learning presentations he attended, and how dev teams can use AWS AI services to build AI functionalities from scratch. Third, they talk about "How DevOps Culture getting evolved" across worldwide since its inception in 2009. Stanley finds DevOps became the necessary for agility; moving towards the direction of "Infrastructure as a Code" and gets into the Continous Integration workflows along with application code. Finally, Stanley talks about Security Automation, and how Automation in the security has taken overall security to the next level. He shares the "Psychology of Security Automation," its placement from day one in the project. And how tools from NetFlix like Lemur and Repoman automates SSL creations and User permissions and facilitates development team a pace of “Move and Fast Break the things, ” and fulfills testing and security compliance. WhatsApp replacing traditional CRM tools in Brazil. WhatsApp Messenger is an instant messaging client for smartphones. It's intended to send text, audio, video messages to the contacts and family/friend groups. But surprisingly in Brazil, this direct messaging app turned to be one of the most popular platforms for digital marketing and eCommerce and virtually replacing traditional CRM platforms. In this podcast, Atish Narlawar talks to Fernanda Saboia, Digital Strategist at Huge about her research in the Brazilian Digital Marketing space “The Rise of WhatsApp in Brazil Is About More than Just Messaging." Fernanda starts the conversation with the brief introduction to the research, and what made her work on this topic. She gives the figures stating how WhatsApp is so close to Brazilian and it's already trumped the other social media(Facebook/Twitter/Instagram) with user engagement, and the most significant user "Open and Read rate." She states, read rates for organic search is 7%, email is 22% while direct messaging has impressive 98%. She introduces some real-time use cases, where business owners use WhatsApp to connect to the segmented audiences, and discuss the implementation, economics behind it with types of issues owners face and how they overcome with smaller adjustments. Although WhatsApp hasn’t facilitated any services(aka. API) to leverage it as a CRM tool, she thinks it's definitely on their radar. With much discussion happening in the digital space about Conversational UI, AI bots, data-driven engagements, Fernanda believes WhatsApp will come up with a new groundbreaking product, to leverage the power of direct messaging and Facebook expertise and will compete with top CRM products in the market. She observes the issues of privacy, spamming and other types of noise in this system and sees the adverse impact on the businesses in case they try to use it as a platform to push the content. She also finds a social aspect in this engagement, where business owners are trying to make social groups and feel their customers together to share some interests, and that's a good plus point. Fernanda thinks this phenomenon will replicate in other continents like Asia and Europe and very optimistic about WhatsApp as a niche player to serve this market better. Vue.js - The next great JS framework. Its design emphasized the "Ease of Use" and adopts the Model–view–viewmodel (MVVM) design paradigm which helps in the simplification of conception. Wes details about the Vue components, two-way data flow, and data binding model, state managements, Veux and the tools interacts as a part of the full blown ecosystem such as Vue Router, Chrome plugin, Vue-CLI, Vueify, Vue SSR. In the end, He tries to compare Vue with React and Angular, presents the strengths Vue possess with its simplicity, lean learning curve, very active developer community and its influence and adoption in the current market. He discusses, how Alibaba is getting attracted to its development and the progress towards Vue-Native Weex for the native bridge similar to React-Native. Wes also helps to understand, How Vue can be fit into Elm, Meteor ecosystem and can scale to production level grade app if needed. This blog's content is licensed under CC By Sa, proudly generated by Jekyll and set in the Ubuntu Font.